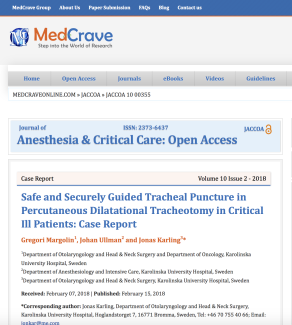 Conclusion: SafeTrach is a new simplified and safe technique to perform percutaneous dilatational tracheotomy (PDT) that eliminates known risk factors compared with existing percutaneous techniques. In the present clinical study, also patients with disadvantageous anatomy not suitable for conventional PDT (CPDT) were treated without complications using SafeTrach. PDT with SafeTrach (STPDT) offers an excellent solution for patients who need tracheotomy in connection with elective ear- nose- and throat (ENT) surgery. Objectives: To asses a new technique for percutaneous tracheotomy. 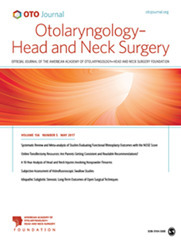 Methods: Seventeen patients were tracheotomized with STPDT using SafeTrach for the initial penetration sequence and single step dilatational techniques for the dilatational sequence. The patients represented a variety of different neck anatomies. Fifteen patients were head- and neck cancer patients that were subjects of free flap transplants. Results: This study showed that STPDT was safe and easy to perform and time-efficient. The median duration of the procedure was 11,5 minutes and the puncture was in all cases located in the midline of the trachea either between the 2nd and 3rd tracheal ring (n=13) or between the 3rd and 4th ring (n=4). Keywords: Tracheotomy, tracheostomy, percutaneous, tracheostoma, intensive care, head and neck tumors, head and neck surgery, upper airway obstruction. 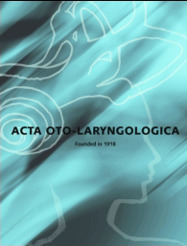 The objective of this study was to investigate a new technique for tracheal puncture during percutaneous dilatational tracheotomy (PDT). A new invention, known as SafeTrach, was used: this is an instrument, which allows exact localization of the puncture site with built in protection of the posterior tracheal wall. Surgery was performed on seventeen patients with this technique and our experience is described in this report. The results showed that this new technique minimizes known risk factors compared to existing PDT techniques including patients with disadvantageous anatomy. This article reports on 2 cases of critical ill patients in need of tracheotomy. Both patients were subjects to percutaneous dilatational tracheotomy but had a difficult neck anatomy and hence difficult to find the proper puncture site that should be between the 2nd and 3rd or 3rd and 4th tracheal rings. To make it possible, the punctures were guided with the help of a new device – SafeTrach. This device has an inner and an outer shank that functions like a tweezers. When the inner shank is in place inside the orotracheal tube and the outer shank is connected to the inner shank, the puncture needle in the tip of the outer shank is pointing against the tip of the inner shank inside the trachea. This part of the inner shank is protruding from the tube, ensuring that the puncture will not be made in the tube or in the posterior wall of the trachea and in a proper angle. In both cases the procedures were successful and made in less than 10 minutes.